Triumph motorcycle manufacturer has introduced a special motorcycle called Triumph Tiger XCx. The sheath of unique motorcycle was disclosed for the first time in the Motorcycyle Live 2016 at National Exhibition Centre, Birmingham, England. 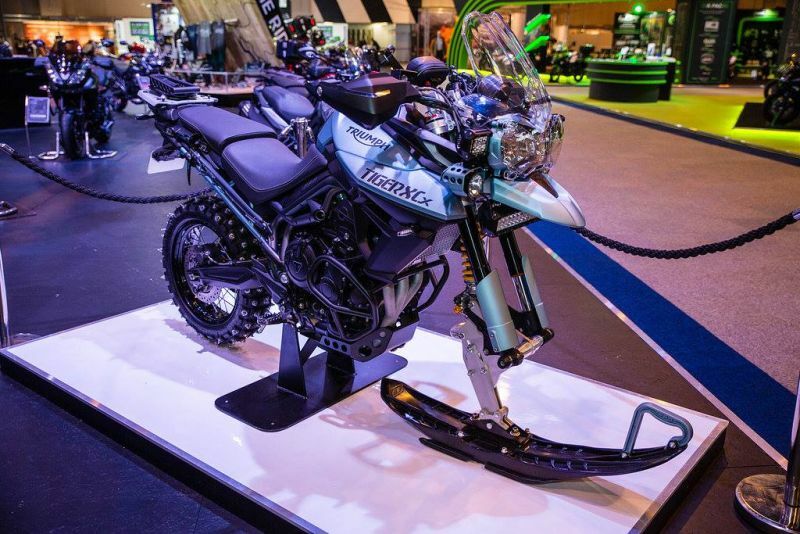 Triumph Tiger 800 Ice Bike created as a vehicle to traverse the snowy road. And the motorcycles are built with the same platform with the Triumph 800 XC adventure motorcycle. As reported by Autoevolution on Tuesday, November 29, 2016, the British motorcycle manufacturer to make changes to its feet. Seen this bike is no longer using the front tire, but changed using skis completed with custom suspension. While the rear tire use a special tire for snowy roads. 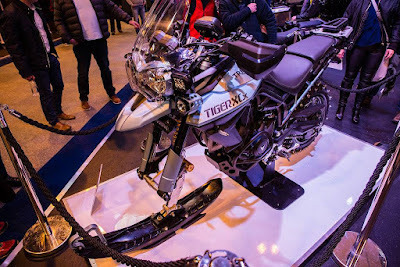 Triumph also pinned some support device in the Tiger XCx such as a new handlebars, digital maps, LED lights, engine guards, footstep with teeth to prevent slippage, up to a special hammer to break the snow or ice on the road. However, the company was not mention of whether this motorcycle will be mass produced or only as a display during the exhibition takes place. While on standard conditions Triumph Tiger 800 XC hold a 800 cc engine with the power up to 94 bhp at 9,250 rpm and maximum torque of 79 nm at 7,850 rpm. The engine is combined with a six-speed manual transmission system.